They should remaster CNC Generals, after they killed generals 2. The only question to be answered is will it feature Microtransactions, or will it be a remaster of Command & Conquer. They can only pick one, not both. ops: ... well shiat... grumble bumble fart fart toot toot bumble bumble mumble... yep think I got everything right - anyone else? 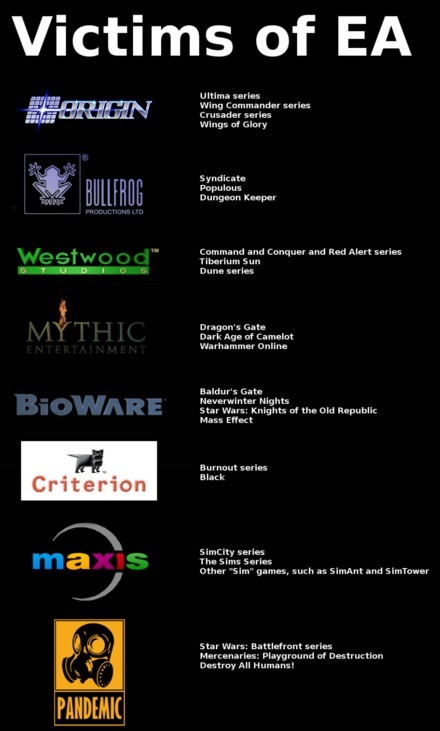 Oh a C&C remake... nice, well I for one am happy & hey if it tests & reviews well then alright. I'll buy it / play multiplayer. Always was a fan of the original series. Excited to see a C&C return but with EA running the show, my expectations are rock bottom. I await them proving us wrong but I seriously doubt it. This will be C&C by name only. All the big publishers are like that more or less. EA ruins franchises, Microsoft kills them, Activision and Ubi run them ad nauseum, etc. Some developers spin off to their own companies and the cycle starts again. Killed Battlefield trying to turn it into COD. Battlefield should feel like a total open game where you choose what to do. But BF1 BFV don't feel like that. Starwars battlefront was another game ruined. And they were all great at their respective times, but I don't think I need a C&C remaster. this is actually the game that first started me into PC gaming and later into PC hardware I hope they don`t botch it like they did the rest of the series. and those images just do not make me think of the original C&C.